we worked hard during winter and improve hostel´s look little bit, prepare our place more comfortable for your stay and colorful for your eyes. Come and feel athmosphere in our hostel, you don´t find here super modern facilities, you will find here slightly of punk, modern and communistic style which do our hostel original and different from other places. WHAT IS NEW IN THE HOSTEL? - situated right in the city centre. - within 7-minute walk to the Wenceslas Square (Vaclavske namesti). - dormitory room with five, six, seven or nine beds. All rooms are spacy enought, lockers in dormitory rooms. Lamps up the beds. Offer of female rooms only. - all rooms equipped by table, chairs, coat-rack, mirror and lamp on table. â¢ the receptionists are open mind people, Tomas and Marketa are studing university, Karel is metal musician, Janek is our cultural referee. The maintenance man Honza can help you to repare your broken suitcase or any other trouble during your stay. Cleaning ladies Lenka and Tana are taking care about the neatness in the hostel. Manager´s name is Marketa and you can meet her in the hostel from Monday till Friday running the hostel. You can recognise the staff becuase of turquoise T-shirts. â¢ all days a year round. Safety key-card system is protected our hostel. Each room separately lockable only with its own room-card. Security cameras at the reception. Online web camera in the hostel. Police station just opposite the street. WHY TO STAY IN OUR HOSTEL? 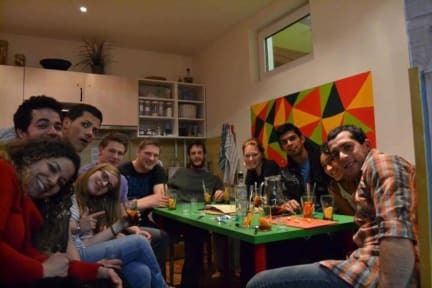 If you want to stay IN THE CENTER OF PRAGUE at VERY LITTLE COST, feel LIKE AT HOME, meet PEOPLE....Advantage Hostel is the BEST CHOICE! 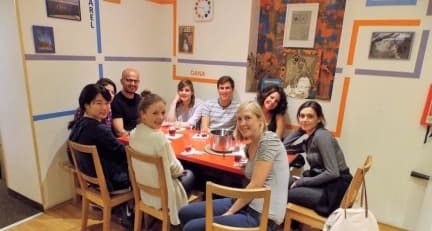 I really loved my holidays in Prague thanks to this hostel!! There are activities everyday, a inside common room and an outside (smoking area) one that allow you to talk a lot with the other travelers. The staff is here for you at any time and they are really friendly (Lukas is very nice)! The breakfast is not really big but good. Super hôtel pas très loin de la gare. Evènements organisés tous les soirs dans le 'salon', très bon atmosphère. Un bon hôtel pour s'amuser et rencontrer du monde ! First time in an hostel but it was great. The location is nice with lot of thing nearby. The atmosphere was good but not great. What I mean by that is that people weren't staying much in the common areas. Some nights it was a bit boring for a solo traveller. The good part is that there were activities organized almost every night. I really enjoyed my stay at this hostel. Breakfast was good, quality of the accomodations was fair, people working there (especially Lukas!) are really helpful. Thank you! Vraiment l'hostel de trouve dans un endroit à proximité de tout ,le staff est formidable. Good hostel. I stayed in the female dorm and it was big and confortable. However, the staff's English is not great and the room has not been cleaned the entire length of my stay (more than four days). The bathroom gets cleaned around 8 am, which is not early enough as the bin is full etc. The free breakfast is a buffet but the hours are not the most convenient. The wifi does not work great (only at peak hours).